Surprisingly delicious! We love or used to love the odd Backwoods Sweet Cigars when heading up north, camping, or fishing, outdoors kind of stuff. Well we have found our replacement with Halo’s Tribeca profile. The good news too is that Halo has just launched their VType line, they now produce many of their popular flavours (and some new) in a High VG (70/30) variety. This is the first of the line that we have tried and we have to say, it holds up with many high end juices. Halo is a big company with lots of experience and resources, it’s great to see them stepping up their game and producing finer quality juice. Many of us have tried Halo products when starting out, maybe it’s time to give them another try. Tribeca is a dope Tobacco profile. Sweet, Rich, Full Flavoured yummy goodness. It totally reminds us of the good old Backwoods Sweets. With all the crazy flavours we have to choose from, sometimes it’s nice to go back to a simple but great Tobacco. The great aftertaste has you going back for more and we are super impressed with how clean this juice burns for how full flavoured it is. We were sceptical, but now we’re curious. We’ll have more to report as we try more of the profiles Halo sent us. For now you might want to give this one a go if you miss those sweet sweet Backwoods. 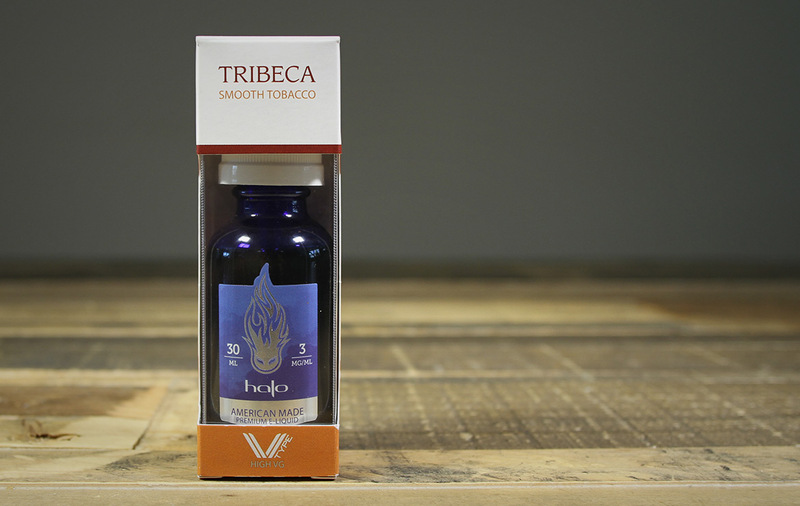 Inhale: Sweet, Rich Tobacco with notes of Vanilla, Caramel, and Rum.